Hat-tip to Google Blogoscoped spotting it first and to Search Engine Land for a round-up of Halloween logos. 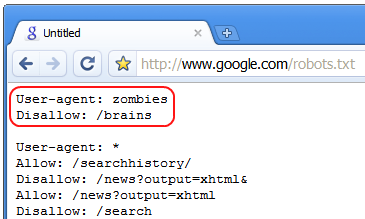 Unfortunatly when you try to access http://www.google.co.uk/brains it says google doesn’t have any brains… oh dear! Hmmm me thinks they could of gone one step further. I notice that if I type the URL in, it says that brains does not exist. The YouTube Hallowe’en logo looks cooler. Douglas those lines are not user agents but actual folders. Google are blocking all user agents from indexing those folders. As an aside, in the UK – Brains is a company which makes meatballs in gravy, which we call Faggots. @Matt.. a robots.txt a day keeps the zombies away! but i thought that a robots.txt a day would keep google away!!! It is very nice to see you and Google always remembering different festivals and traditions. I think this is something which makes Google really special. I just opened google.com but I don’t see the good looking Halloween logo [it is 31st October night here]. May be Google has removed the logo? This is the first time I saw Google robots.txt file. I wonder why I haven’t opened this file before? I also saw the sitemap. There are so many URLs in it. Thank You Google and Matt for always supporting different festivals. Credit where credit is due. This is funny. LOLOL how did you find this? Matt, is google testing something new for serp sorting today? I heared that lots of people are noticing something like this… lots of sites with good placements are dropped in the last few hours. Heck, I even put on my Myspace ‘Hero: Google’ because it’s true – the little shreds of coolness I can translate from the big G corporate cog in to the lil olé web marketing company I work for really does make a difference to morale. Just a shame that not everyone agrees that fun can also mean professional. How could I have missed seeing that logo? They could have also blocked trick-or-treaters from accessing /candy in my opinion. Hah nice and it’s still there. from Pigeon Tech to Zombie protection… I’m feeling really good about them! Then 7/20 or rather 35% of the top 20 won’t be just .edu spam redirects. hmmm… Zombies are not allowed to access brains on Halloween, but was dawn of the dead on a Halloween? I would keep that there as a precaution. Feel free to get in touch with me. So far I would have to imagine, you’re no more real than Santa Clause or Rick Astley knows about IT Security.